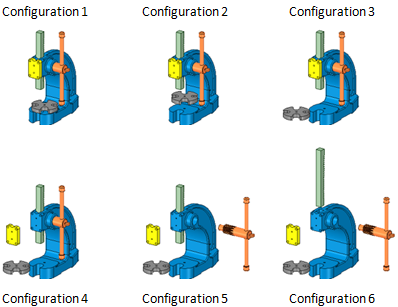 At GoMeasure3D, we have customers who use SpaceClaim regularly to model assemblies for manufacturing. While the exploded view in SpaceClaim provides a spread out view of how assembly components fit together, there’s no easy way to create a step-by-step sequence to demonstrate the configuration process, or create assembly lines to show the connections. Exploded view of an assembly in SpaceClaim. Recently our team discovered the SCExplode add-in that solves this challenge. It offers an intuitive way for SpaceClaim users to animate assembly instructions to ensure components are properly configured according to a standard. Users can create videos for distribution or they can take images of each configuration. What’s great is that SCExplode works directly inside the SpaceClaim environment. The assembly video (top left) is created from a series of six illustrated configurations (top right). SCExplode allows users to create videos in forward and backward sequences so viewers can gain a better understanding of the assembly process. SCExplode also has the ability to create dotted assembly lines automatically to show the direction of the explosion. The video below demonstrates how the lines serve as guides to indicate where each component fits in exploded view. We want to stress that we aren’t affiliated with SCExplode and its developer in any way. We wanted to share this add-in with our customers and other SpaceClaim users who can get a lot of value from this tool for a small price. SCExplode costs $88 per licence but there is a 7 day trial for you to test before buying. You can download the free trial at AR-CAD.